Being pregnant has been a great excuse to try my hand at sewing myself more knit tops - something that I have wanted to do but hadn't prioritized. Having more of a deadline to get things done for them to be useful while I was pregnant helped me get in gear! I have been lucky to also get some nice maternity clothes as hand-me-downs and bought a few things, but I was having a lot of fun sewing these up too. I was tempted to make more but realized it would be kind of ridiculous - but hopefully I can keep that energy going to make more clothes for myself and the kiddo in the future! I made a few out of upcycled tops that I had found at thrift stores - I found that starting with a top that was a 2X size or larger was good to make sure that there was plenty of fabric to use and particularly that it would be long enough to cover my growing belly. For the aqua colored top above, I reused the original neckline and the sleeve and bottom hems. I traced a maternity tee that I owned for the basic tee pattern (sleeve/armhole/sides), and added the gathering below the bust before I cut out the pieces. (To add the gathering, I just sewed a piece of elastic on the wrong side of the shirt, stretching it as much as I could as I sewed). I sewed everything together just using my regular sewing machine, using the knit stitch which is kind of a slight zigzag (the symbol looks like a lightning bolt on my machine) and am very happy with how it turned out! This v-neck tee is even more basic, but was put together basically the same way (minus the gathering at the bust) - I used the original neckline and hems again. I really like the color of this one, it has been a nice basic to wear. I also made some tops just starting with knit fabric that I had on hand. I honestly haven't worn this one too much both because the fit is a little off and it's not really my color... but it was fun practice at least. 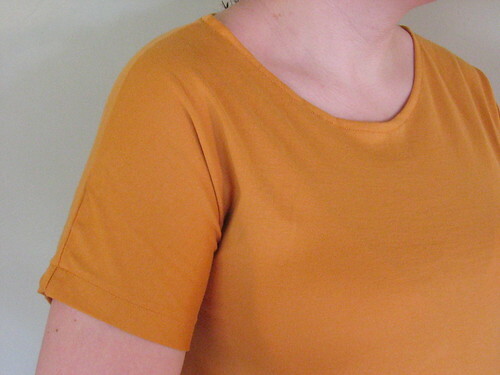 I had remembered seeing Anna from Noodlehead's t-shirt tutorial where you make a t-shirt with kind of dolman-style sleeves where they are just part of the front and back pattern pieces rather than inset at the shoulder. I didn't actually look back at the tutorial before I sewed, which probably would have helped - I think a looser fit in the bust/shoulders is definitely more flattering for this type of tee and it's not what I did. It's not horrible but like I said, it's not my favorite. Definitely piques my interest to try this style tee again though! See how there's just a seam down the top of the shoulder? Definitely easy construction. The last two things that I sewed were based on one of my favorite styles of tops/dresses, where you have a gathered cross front. I made a top as practice (and because I wanted a top) and then I made a dress with the same basic style and pattern. I was pretty proud that I was able to figure out how to make the gathered cross front based on modifying a regular t-shirt pattern and that it turned out so nicely! I didn't have the energy to take photos and write up a tutorial when I was making these, but this style shirt would also be great for non-maternity so if I make another I may write up a tutorial. 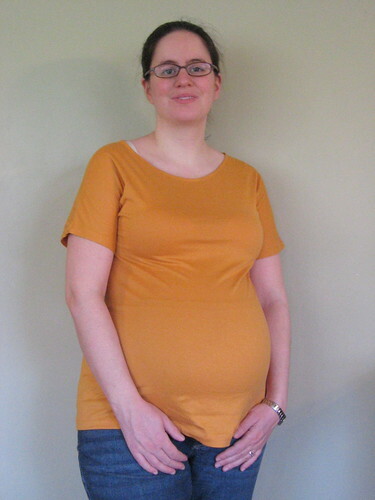 I'm hoping that both this top and the dress still work for non-maternity wear (and it certainly would be easy to make a non-maternity style using less fabric/gathers for the lower part). When I made them, I intentionally designed them to be fairly low cut and intended to wear with a tank underneath - I figure that after baby is born, I can wear them with a nursing tank and they'll work great for that too! 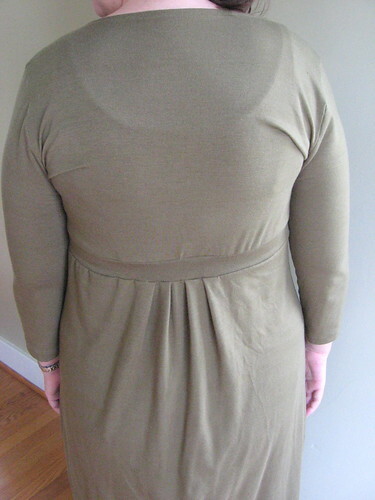 The back for the shirt was also similar to the back of the dress, with some gathers/pleats but not as many as the front. 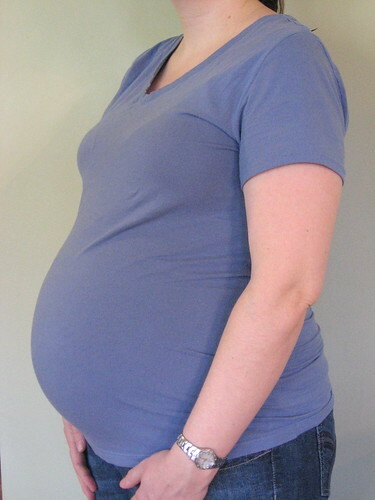 As you can tell from these photos, I'm definitely in the home stretch of this pregnancy! We actually took these a few weeks ago so I think I look even more pregnant now. Our baby is due next week so she could come anytime in the next few weeks! I have already started my maternity leave from work and am taking advantage of the time to rest and also do some more crafts, so hopefully I'll find time to come back and put up another post or two before baby arrives (unless she comes sooner rather than later).